♥ HIGHT QUALITY -- The main material of these candles is plastic of superior quality. AGPtEK tea lights are plastic flameless candles with realistic light. Each tea lights battery operated is thoroughly and rigorously tested. ♥ EASY TO USE -- On/Off switch for easy & convenient operation. AGPtEK flameless tea lights are easy to use; Simply switch On / off on the bottom to control it. 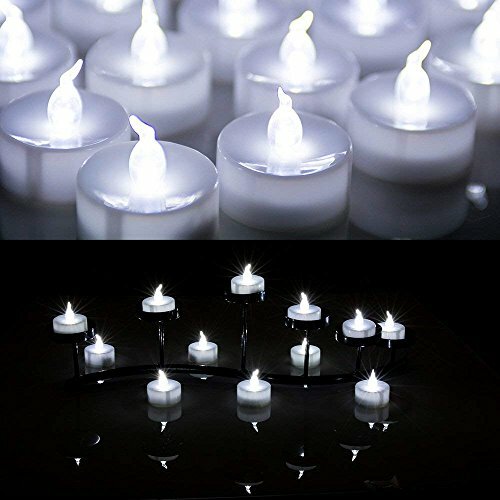 ♥ SAFE TO USE -- AGPtEK led tea lights are flameless, smokeless and long lasting, safe to use. No hot and dirty wax to deal with. Absolutely no fire hazards or burning risks, our flameless tea lights are safe for families with pets or kids. ♥ WIDELY USE -- These candles are ideal for decorations. Our tea lights can be used as mood lights night lights with votive holders or other holders like glass cups. You can put the tea lights battery operated on table or other place in restaurants, home and garden wedding, party, festival decorations. ♥ 100% SATISFACTION GUARANTEE -- We are extremely committed to our customers. If you are unsatisfied with the led tea lights, simply return it within 30 days for money back.